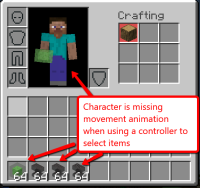 When you use a controller to play Minecraft and select items in your inventory, the characters 'look around' movement animation is missing. I can confirm that in the console version (Before better together update) this animation is not missing like it is in this version of the game. Play on Xbox or Minecraft Windows 10 Edition (using a controller). Select items in your inventory. Observe that the character model doesn't follow what you select on the screen like it does when you use mouse and keyboard. 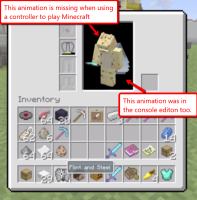 I can already confirm that the character model moves when using a controller in the previous version of Minecraft for Xbox.